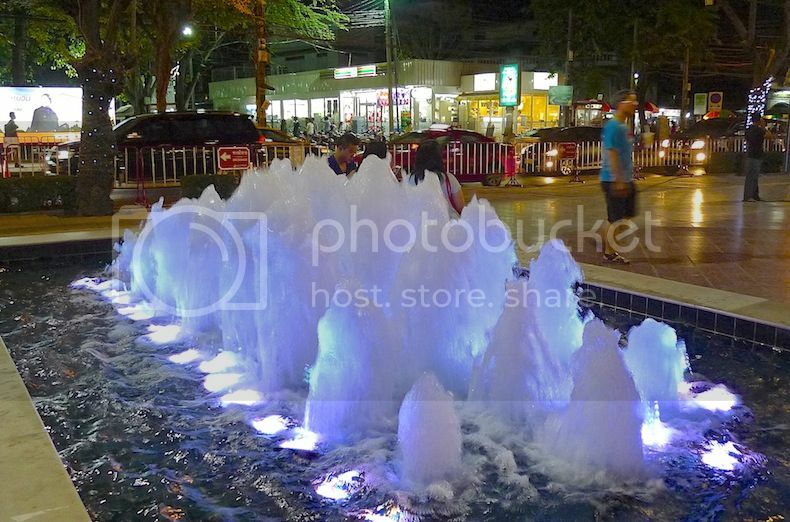 Most people go to Bangkok to do just one thing - shop, shop and shop. 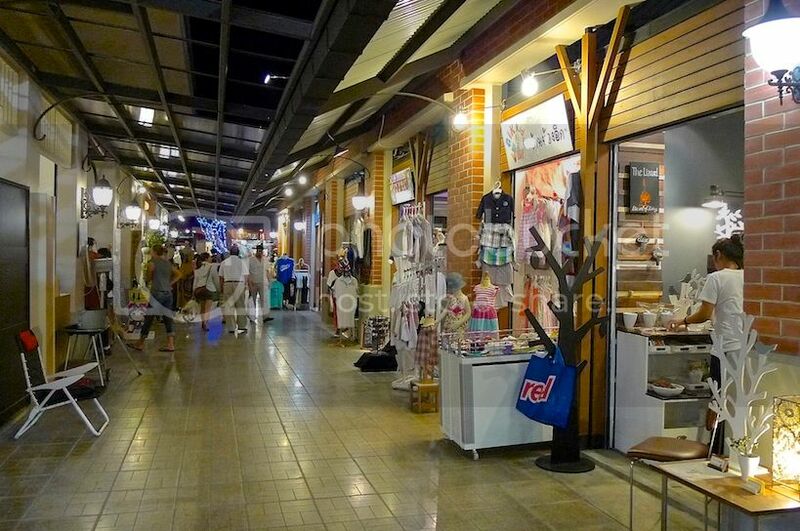 Although I am not an avid shopper, I do enjoy the experience of shopping in this charming city. 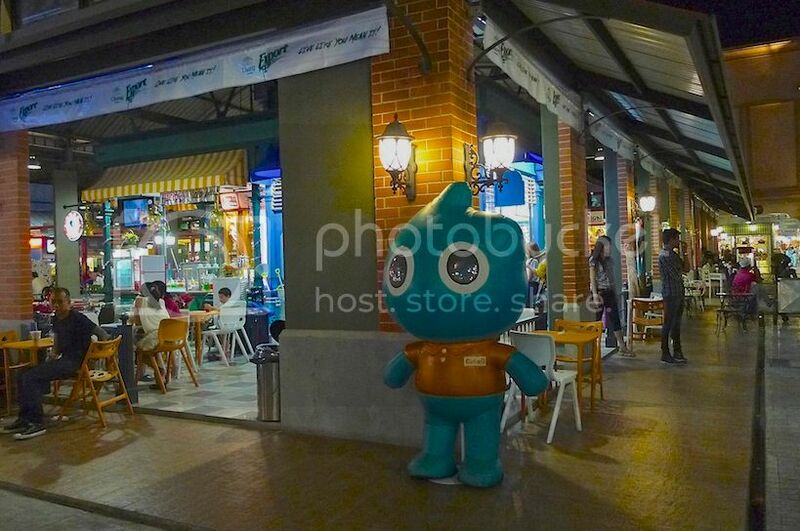 During our second evening in Bangkok, my friend and I visited Asiatique The Riverfront, an upscale night market and trendy shopping area along the Chao Phraya River waterfront. 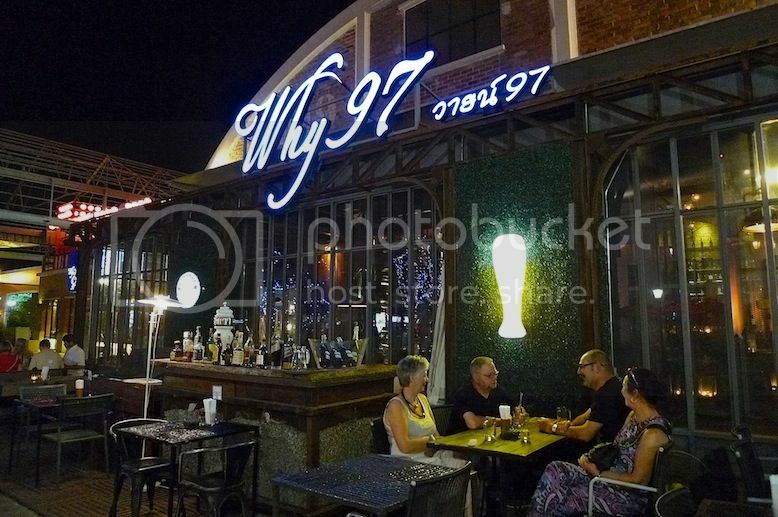 Opened in May 2012, this night bazaar had been getting quite popular, probably filling in the void left by the closure of the famous Suan Lum Night Market in 2011. To get there, we took the cheapest and easiest route - by boat. 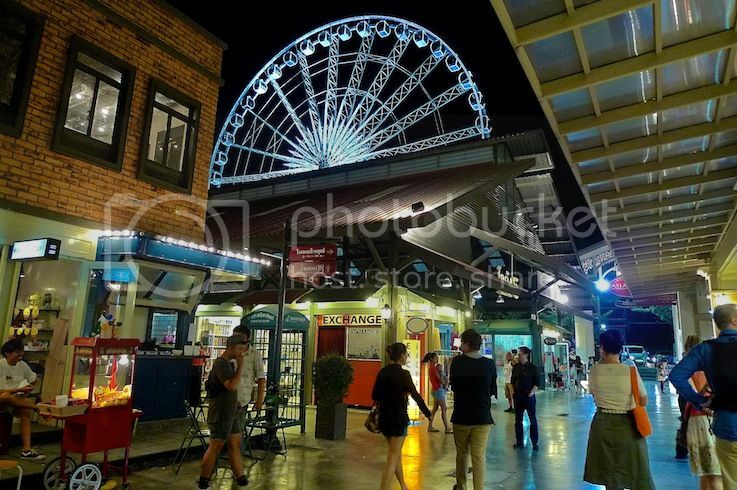 It's a good thing we stayed at Bangkok Loft Inn as it was very convenient to reach Asiatique from there. 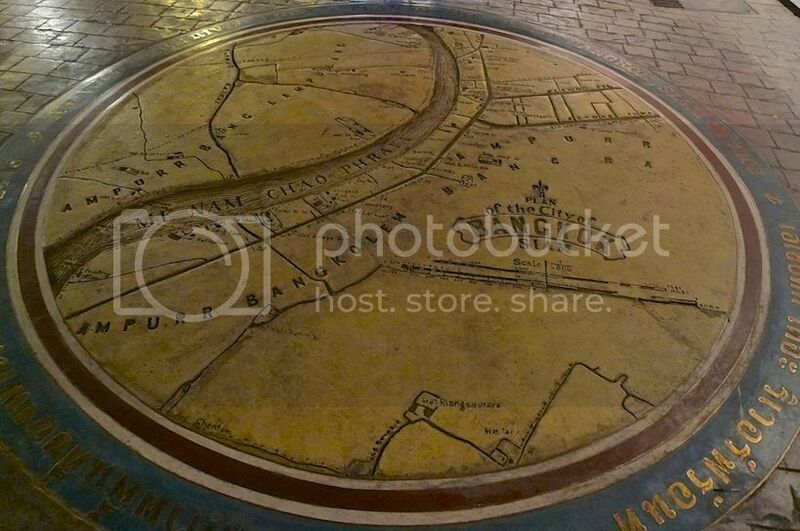 We took the BTS to Saphan Taksin Station and walked towards the Chao Phraya River (via Exit 1 or 2). It took just 2 minutes to reach the Sathorn Pier. 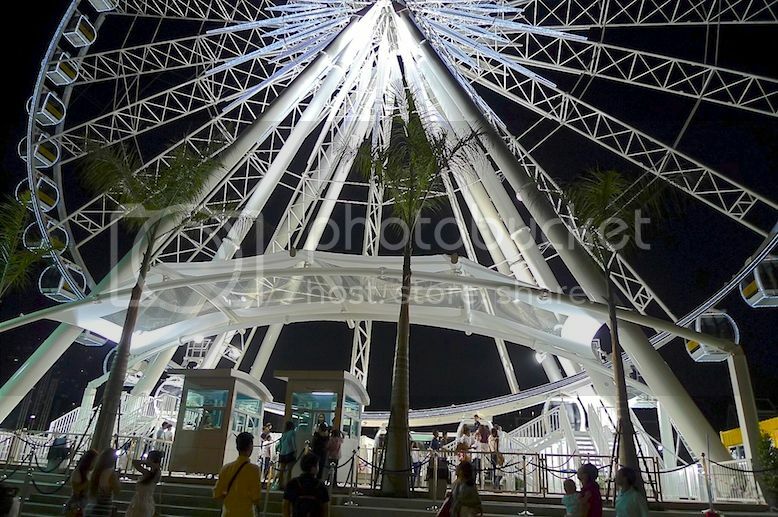 From there, we walked to the furthest pier and took the free boat shuttle to Asiatique. Yes, you read that right. 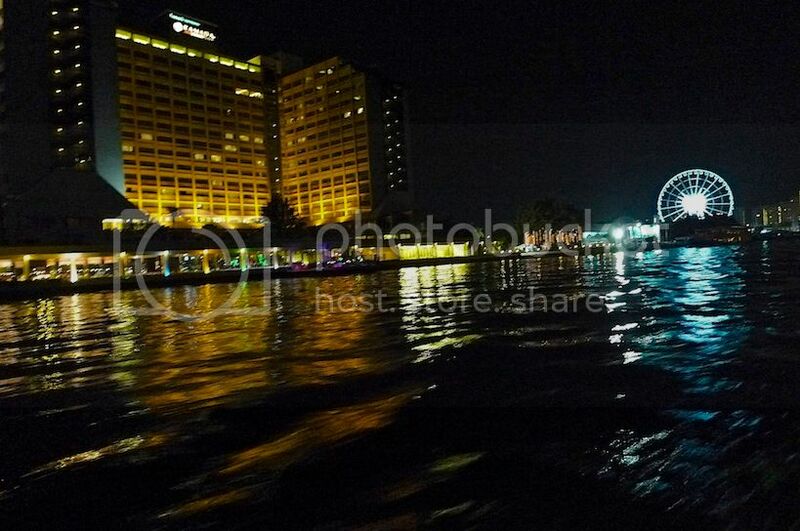 The boat to Asiatique is FREE. It leaves every 15 minutes starting from 4.30pm till 11pm. 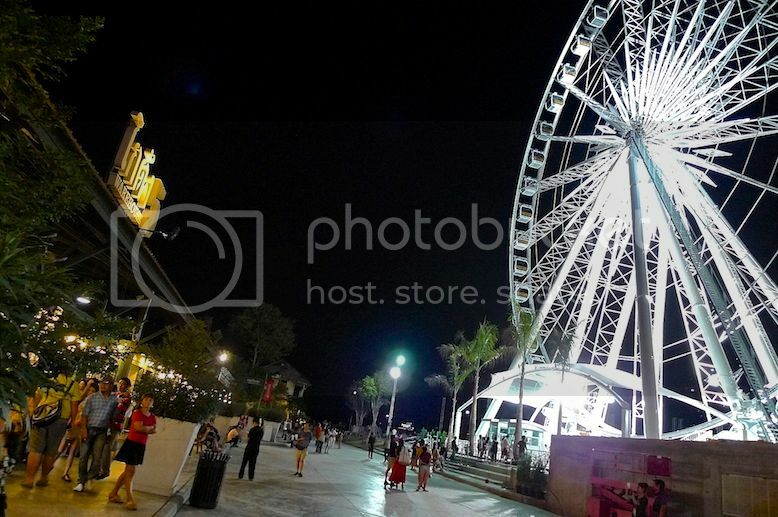 The last boat leaving Asiatique Pier back to Sathorn Pier is at 11.15pm, so do take note of the time if you plan to go there! It was a short boat ride - probably about 10 -15 minutes. The good thing is you get to enjoy the river view at night. Definitely better than sitting in a taxi and getting trapped in the notorious Bangkok jam! 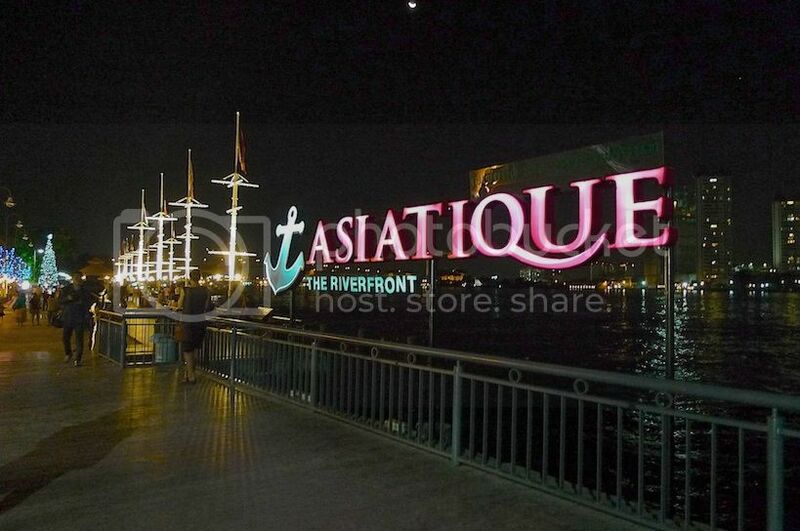 Asiatique is actually a homage to Bangkok's past as a riverside trading post in the early 1900's where the original pier was used as an export centre for Thai teak wood to Denmark. Many of the original buildings here have been retained and refurbished. 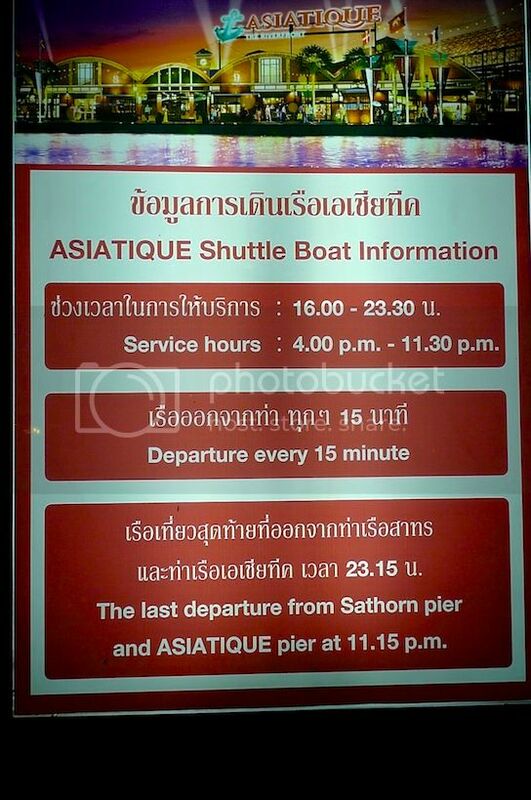 Information on the Shuttle Boat service hours at the Asiatique Pier. 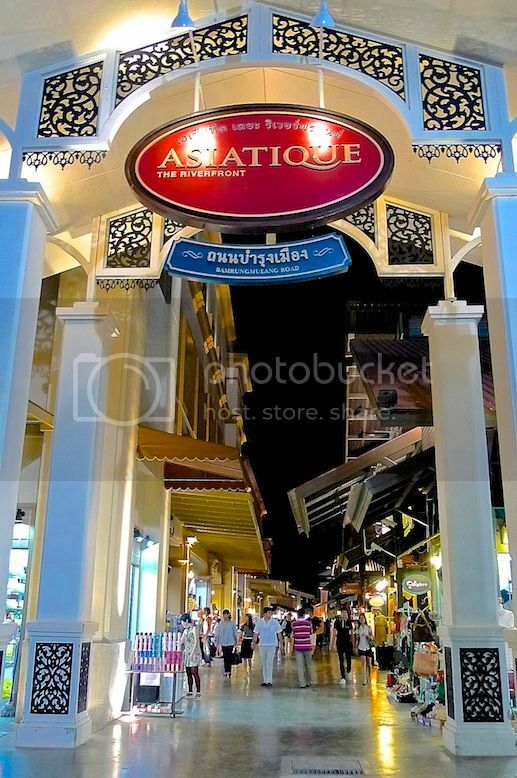 There are 4 sections or districts in Asiatique. 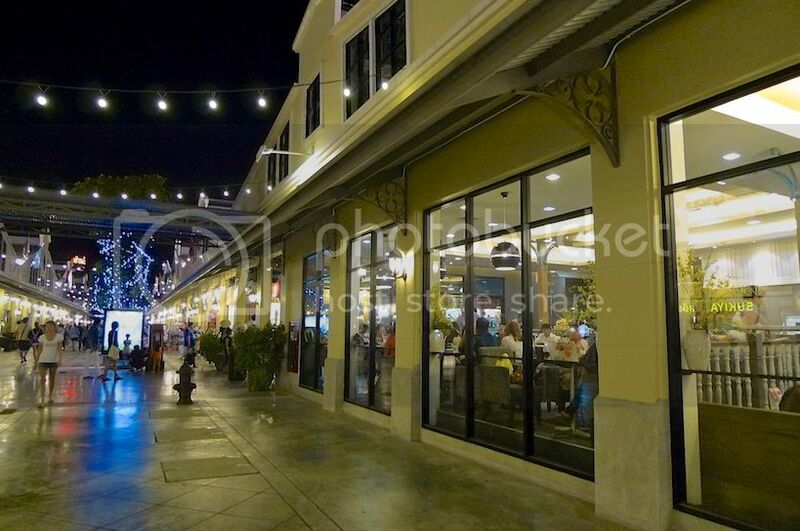 The Waterfront District (blue section) closest to the waterfront promenade is mainly filled with international restaurants and wine bars offering a breathtaking panoramic view of river while you dine away. The Factory District (orange section) contains over 500 fashion boutiques and more F&B outlets in old, refurbished warehouses. 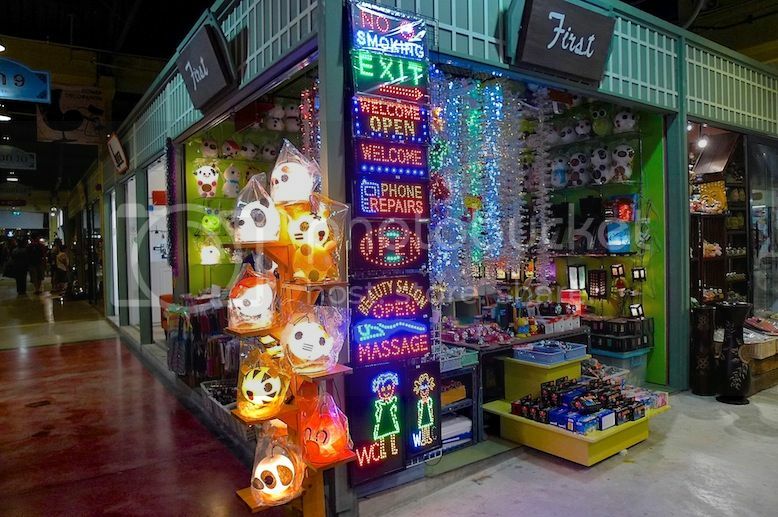 You can find souvenirs here like those at Chatuchak Market, but the prices are definitely higher. 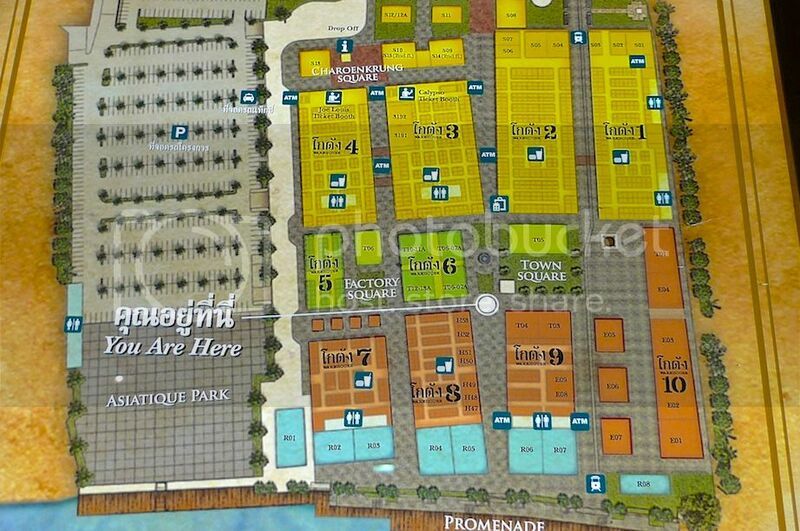 The Town Square District (green section) houses a food court, many retail outlets and outdoor activity and events area. 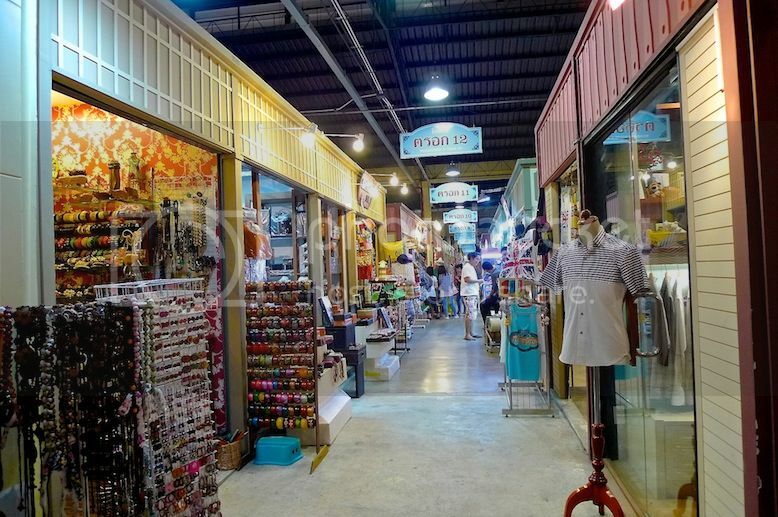 The Charoenkrung District (yellow section) is the main area for shopping and entertainment as there are over 1,000 retail shops here! Also within this district is the famous Joe Louis Puppet Theatre and the ever popular Calypso Theatre featuring ladyboys cabaret shows. 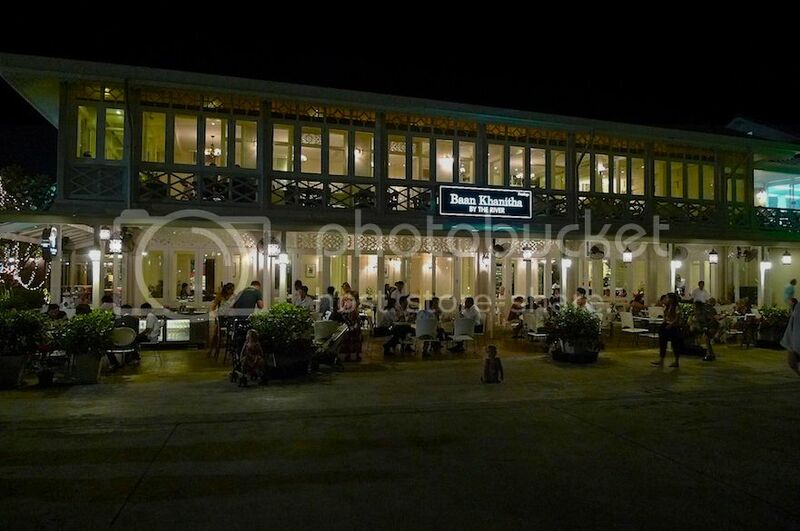 Below is Baan Khanitha, a Thai restaurant facing the river. It's quite pricey and I think, mainly aimed at tourists. 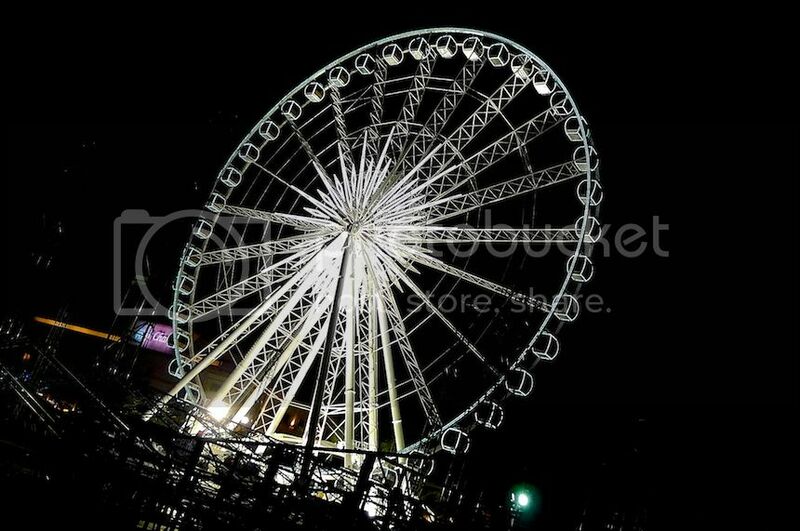 There was a giant Ferris Wheel at Asiatique. It was quite an eye catching attraction at night! I did not ride this Ferris Wheel because there was quite a long queue for it. But I think it would be nice to take the ride as you would get a bird's eye view of Bangkok city from up there! 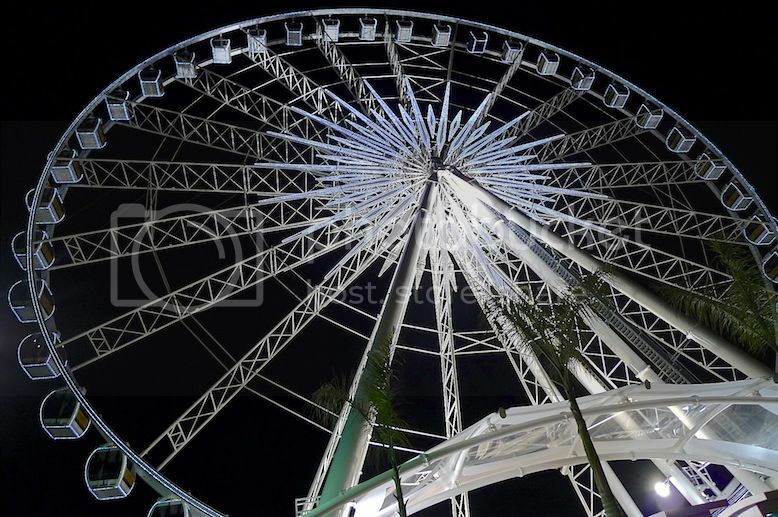 The Ferris Wheel is just opposite the Retail Warehouse 5. Part of the Ferris Wheel could be seen from inside the warehouse area. Entrance into the shopping area. 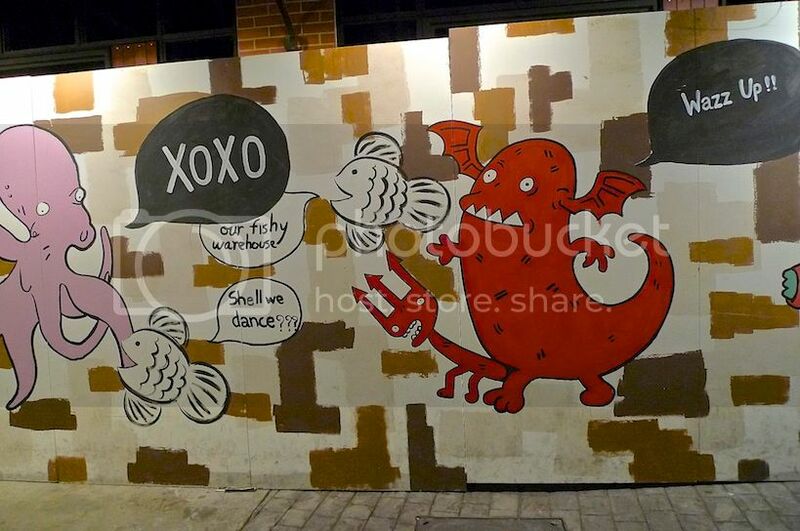 Saw some really cute and funny drawings along the wall in an alley. Interesting illustration on the ground. 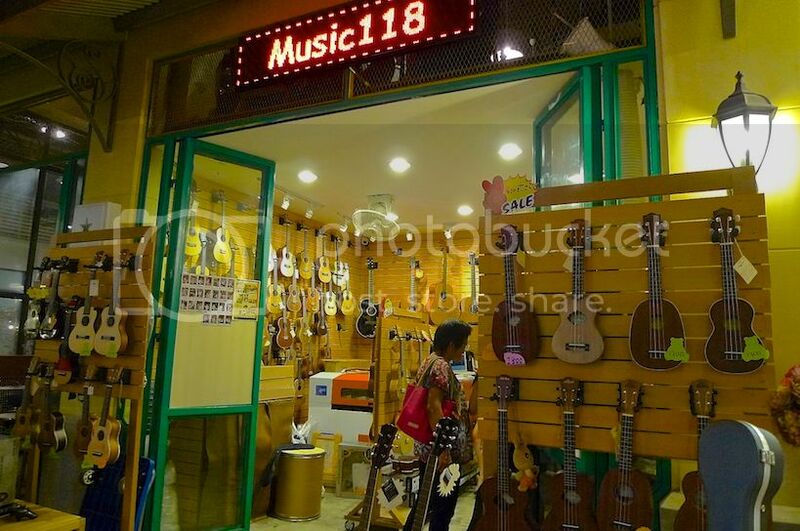 So many retail shops and boutiques selling everything under the sun! It's like a shopper's paradise. 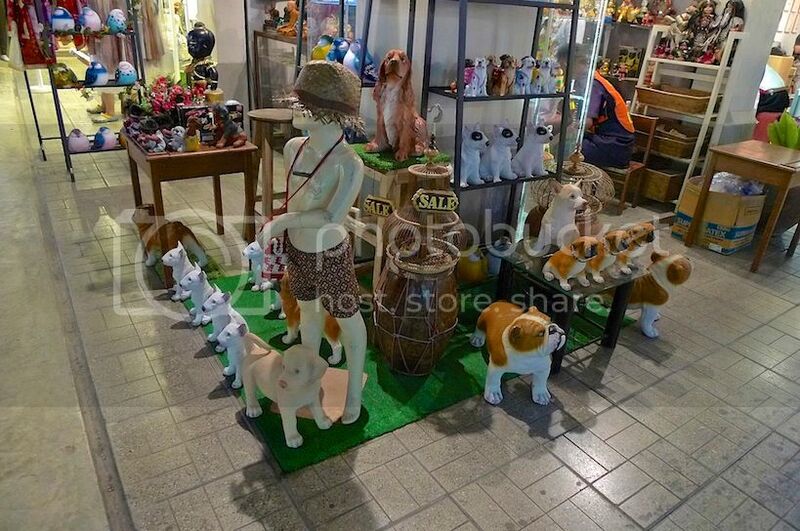 Clothes, accessories, souvenirs, toys - all can be found here. Oh, did I mention there's an Apple Store here too? Forgot to take a picture of that! Anyway, I felt Asiatique is like Chatuchak Market except that it was much more organized, spacious, comfortable and trendy looking. And the prices were of course more expensive. 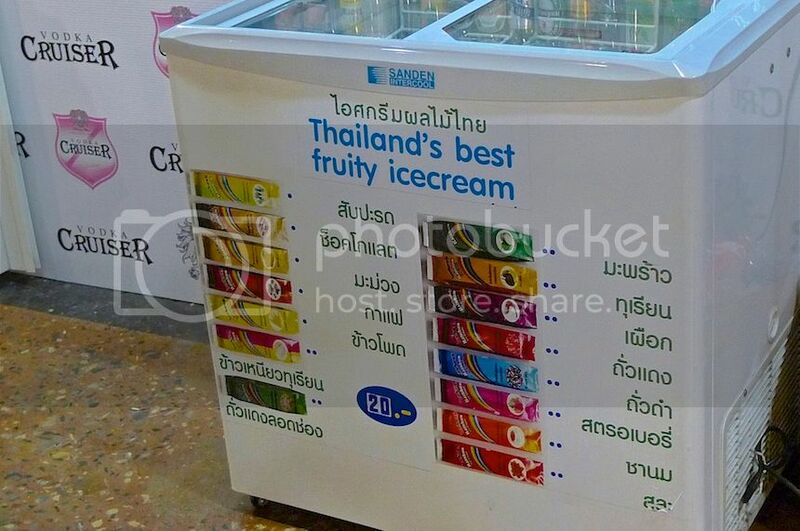 However, without air conditioning here, some may prefer to shop in malls like MBK instead as the prices were quite similar. Dining shops and eateries were everywhere! It's impossible to go hungry here! 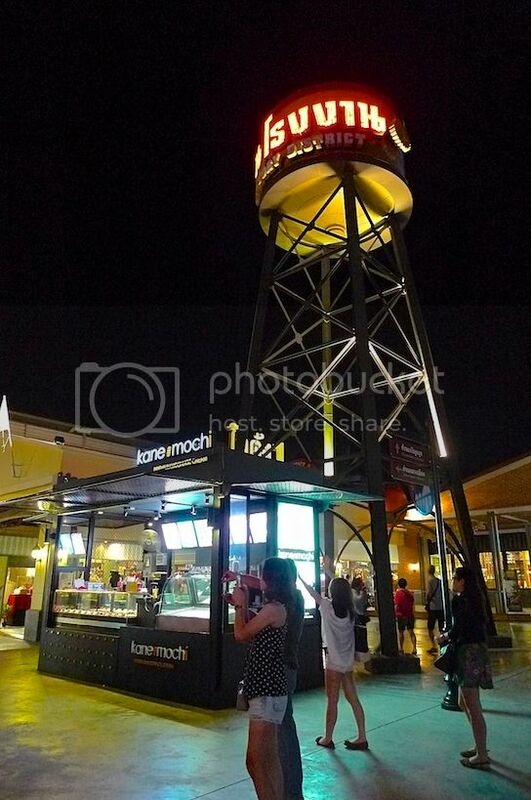 A kiosk selling mochi and ice cream. A pub and restaurant - great place to chill out! 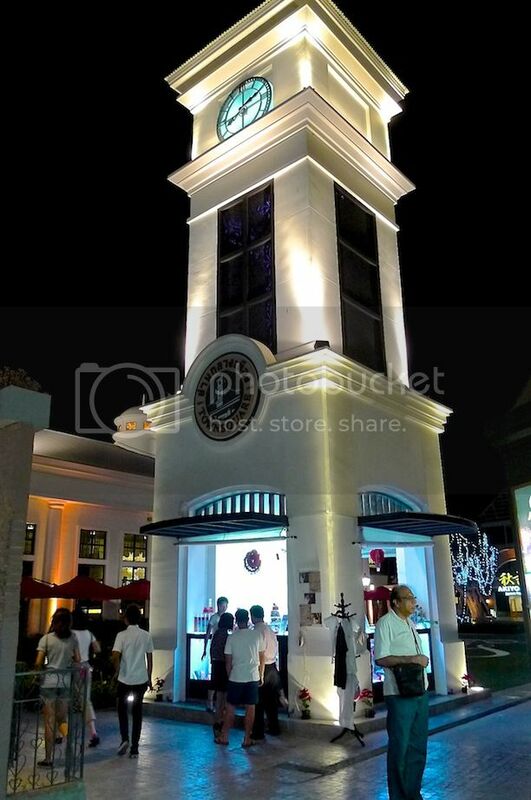 Clock tower at the Town Square District. 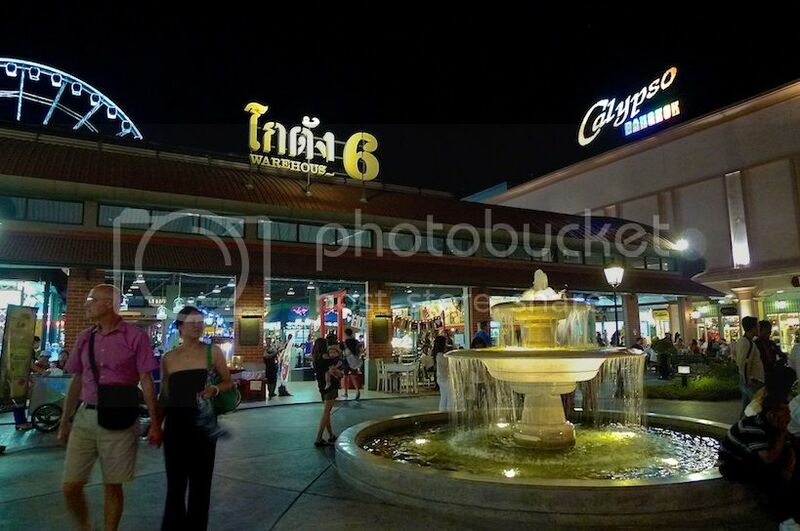 Retail warehouse 6 and the Calypso Bangkok Theatre featuring ladyboys cabaret shows. 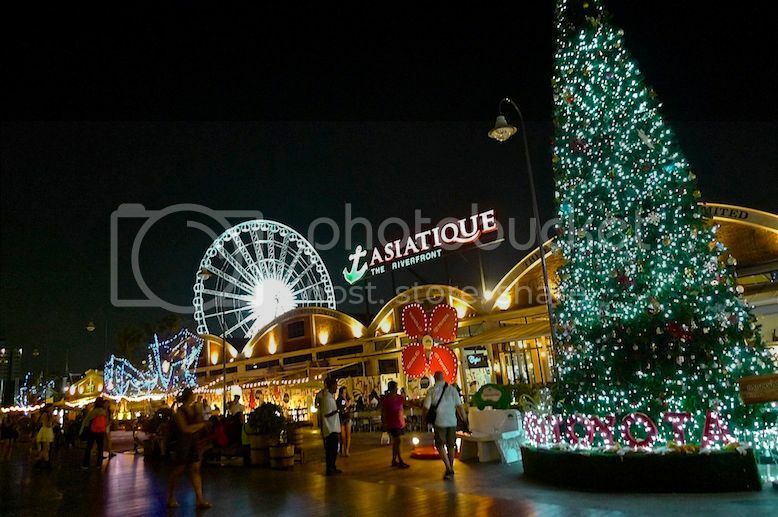 If you are into shopping and eating, Asiatique is the right place for you. However, bear in mind that the prices here are not exactly friendly to your wallet. 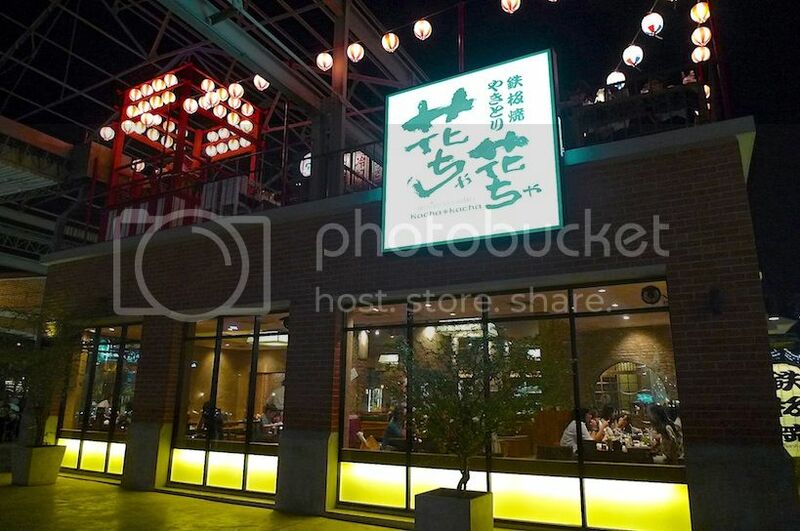 MBK and Platinum Mall may be better shopping options for you. 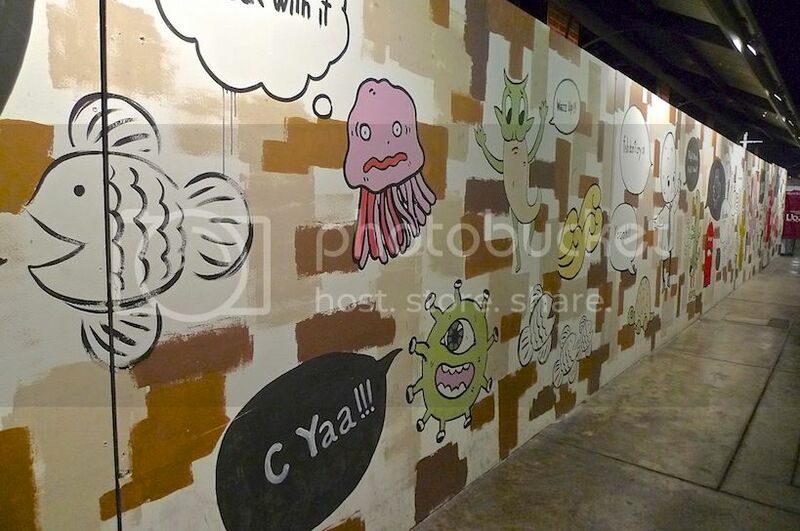 Nevertheless, I think it's great for a good night out with friends. 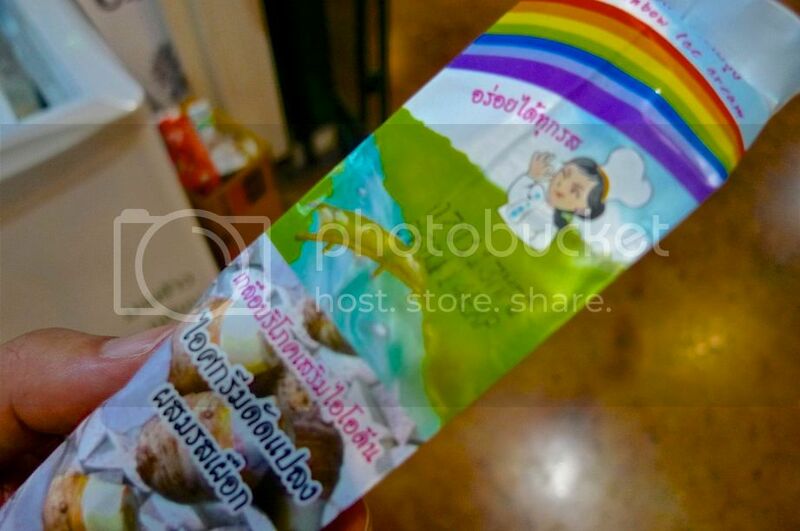 One of the things that I really, really enjoy at Asiatique was surprisingly .... the ice cream! 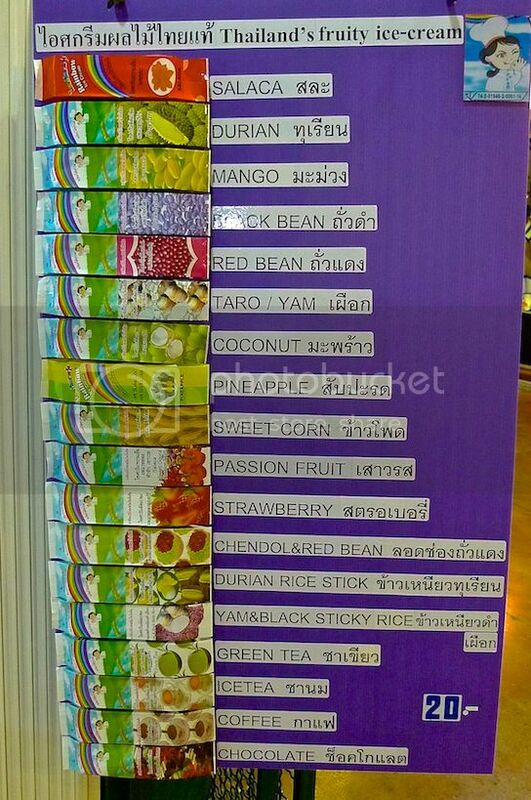 The Durian Rice Stick was amazing! I went back for two more rounds of this ice cream. Yum!! 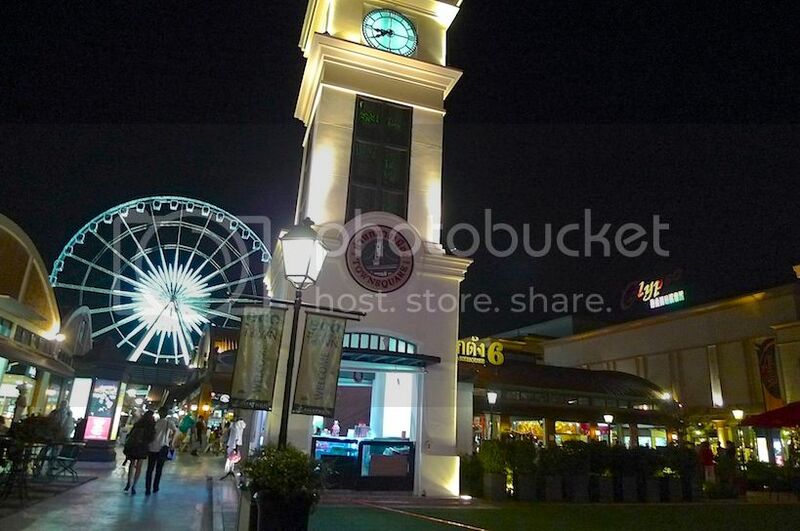 My friend and I spent about 2 hours at Asiatique. 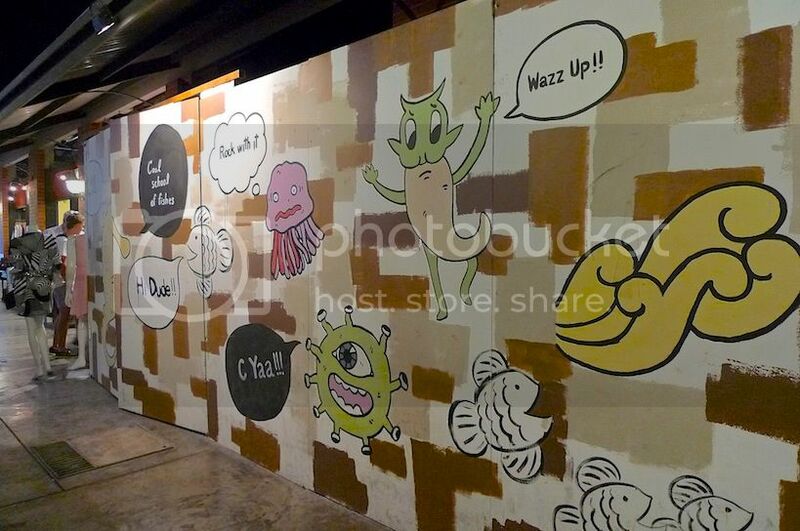 We could have spent more time if we had gone for the puppet show or the ladyboy cabaret show. Oh well, maybe next time then. But one thing's for sure. 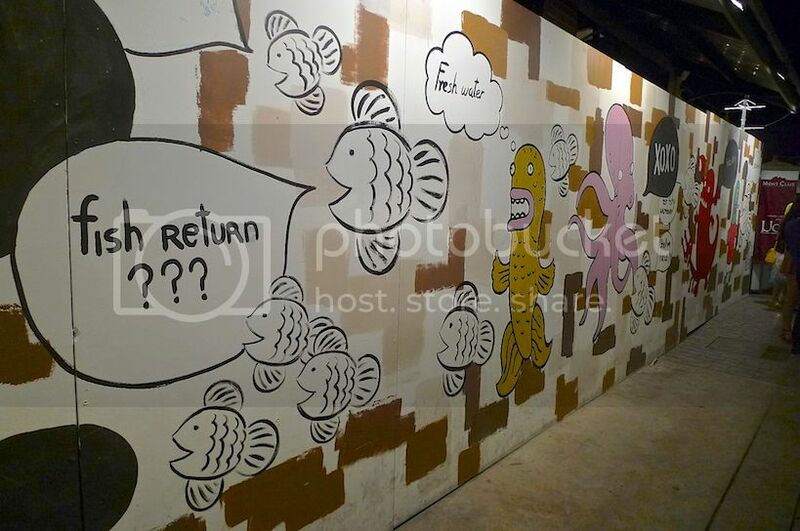 I will return just for that Durian Rice Stick ice cream! LOL!